I know I may be a bit biased, but Food52 is one of my all-time favorite food and cooking sites. The wide-ranging content—from interviews and recipe contests to menu ideas and comprehensive breakdowns of techniques and ingredients—is accessible, witty and, most importantly, emphasizes community. What I admire most about Food52 is its willingness to cover every topic and dietary style—no one is alienated. A particular favorite column of mine is The New Veganism , by Gena Hamshaw. Since Gena shared a recipe for vegan pesto a couple of weeks ago, I've made it more times than I can count. Last night, I whipped up another batch and served it over spaghetti with slow-roasted cherry tomatoes. 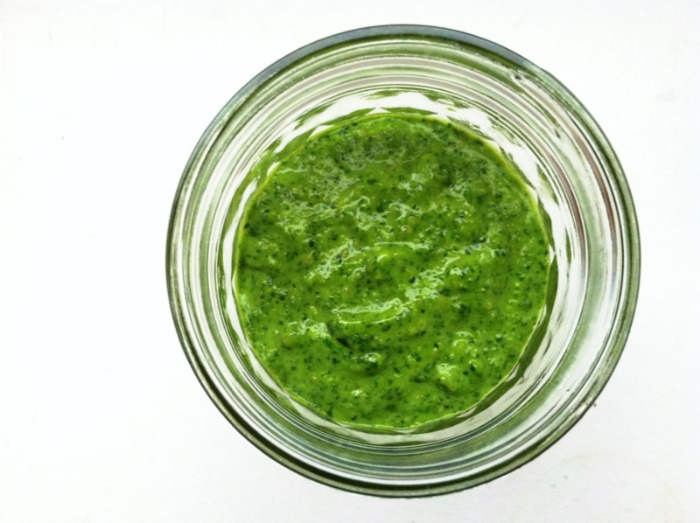 I have a feeling I'll be eating this pesto on everything all summer! Place basil, parsley, pine nuts and garlic in a food processor fitted with the S blade. Pulse to combine, until the mixture is coarsely ground. Next, with the food processor running, slowly pour in the olive oil. Add lemon juice, nutritional yeast, salt and pepper, and pulse a few more times to combine mixture completely. Transfer to a sealed container and store in the fridge.